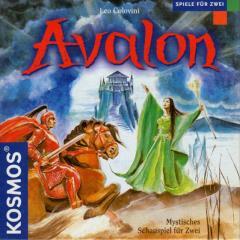 Avalon is a card-based game where a line of 11 landscape cards form the board and the cards in your hand are made up of Knights and Enchantresses. There are 8 of each in each of five different colors, for a total of 80 cards, which both players share as a common draw deck. The game starts with the landscapes face down, randomly assigned knights or enchantresses on each player's side of the landscape cards, and five knights/enchantresses in each players hand. In the course of the game, if you play knights on your side of the territory and you have at least as many cards on your side before playing the card, you have the option of declaring an attack with that knight. The other player has a chance to respond by defending with a knight of exactly the same color (in which case both knights are left in place). If the attacker is successful, the loser loses all of their cards from their side, and the winner loses an equal number. Then, the winner must lose an additional number of cards from their side or the hand equal to the total number of knights on both sides that were involved in the conflict. Finally, the region is turned face up with the crowns on the bottom facing toward the controlling player. You can only attack up to two landscapes per turn, but you may play as many cards as you would like to on your turn. The max hand size at the end of a round is 5. The object is to control 15 crowns at the end of your turn (number of crowns on a card ranges from 1-3). Two landscape cards have special abilities - Avalon reduces your loss from battles by one once per turn, and the forest with a standing stone allows you to declare an attack on your opponent with an enchantress as if she was a knight.